Standards Australia HB 197 provides best practice to determine an acceptable level of slip resistance; however, care must be taken to choose the test method that best reflects the nature of the footwear and the contamination that is likely to be present. This article discuss’s the importance of sustainable slip resistance and enhanced methods to predict likely changes in slip resistance through wear and deterioration. Ceramic tiles along with most flooring surfaces can become less slip resistant with use. This can occur rapidly, such that, some relatively new products can become hazardous within a short period of time. Currently there are no Australian Standards to identify such problematic products; however accelerated wear slip test methods have been developed to evaluate long term slip resistance. 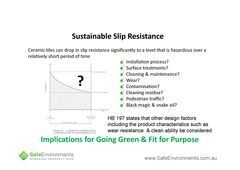 These methods provide manufacturers an opportunity for innovation by identifying and satisfying consumers’ expectations for sustainable slip resistant tiles. Many building codes throughout the world require safety measures, such as slip resistive surfaces, to perform no less than they were originally required to achieve, this has implications for the architect when specifying a surface. The Building Code of Australia (BCA) requires that every part of a building be constructed using materials that are fit for purpose for their intended use. Additionally components of buildings that form safety measures are required to perform to a standard not less than they were originally required to achieve. This includes the provision of slip resistant stairways and ramps forming exits within a building. The New Zealand Building Code (NZBC) states in terms of slip resistance that the surface should have at least a five year life under normal maintenance to meet the durability requirements of NZBC B2. Section 3 of AS 3958.1 Guide to the installation of ceramic tiles notes that consideration should be given to the slip resistance and wear properties of the tile selected. Chapter 3 of HB 197 notes that the slip resistance recommendations in Table 3 must be used in consideration of other design factors; including the amount of traffic and the wear resistance of the proposed floor surface. While the accelerated wear tests may not be incorporated within Australian Standards, it does not abrogate a tile supplier to provide materials that are fit for its intended purpose. Whether or not a standard exists, the onus is for the manufacturer to ensure that the product that they are supplying is fit for its intended purpose. Furthermore any limitations on the product or test results must be made known to the person using or installing that product. This is where enhanced test methods such as modifications of existing methods or alternative applications of existing test methods can assist. If we compare the sustainable requirements of slip resistance with that of lighting standards AS/NZS 1680.0:1998 Interior Lighting – Safe Movement, we see that the lighting standard requires a designed to take into consideration the progressive reductions in lighting over time by aging of the lamps and dirt deposition on the light globes. The Standard suggests that higher levels of initial lighting are required to ensure that the minimum illuminance required is maintained throughout its service life; however it does not provide a method to test for this. Experience in similar situations is required to estimate or predict the loss in lighting levels. In a similar manner, higher levels of slip resistance may be required initially to ensure that the minimum slip resistance is maintained throughout the service life of a floor, taking into consideration, the installation process, wear characteristics, cleaning regime, anticipated traffic and contamination. Ideally the slip resistance of surfaces will not change over time; however, through slip resistance testing and monitoring, it has been observed that the slip resistance of many seemingly slip resistant materials will reduce significantly over time. It might be surprising to go back and test the floor of a surface 12 months after installation to find that the surface has reduced by a couple of classifications. Thus test results obtained on factory fresh surfaces may be illusory, misleading designers into specifying products that may be potentially hazardous within weeks or months of installation. One case study observed that the initial slip resistance achieved a British Pendulum Number (BPN) of 65 prior to installation. Within a few months the surface had reduced to a BPN 40, a reduction in slip resistance of over 30%. Initially grease and oil contamination was suspected as the main contributing factor and a commercial cleaning system was used in an attempt to restore the initial slip resistance. The results proved undoubtedly that the greatest significant contribution to the loss of slip resistance was due to mechanical abrasion or polishing, not contamination as first predicted. In essence, no floor surface will be made available to the public in the condition that it was initially tested. The challenges of detecting loss in slip resistance is further complicated when the inclining ramp test methods (R rating) cannot be conducted onsite. Thus the only indicator of onsite slip resistance performance is provided by the dry floor friction test (FFT) or the wet pendulum slip test. Thus, any initial ramp ratings (such as R9, R10, R11, R12 & R13) used to determine compliance at the design stage are seemingly superfluous and are also made redundant by any subsequent onsite pendulum testing. TABLE 1. Four test methods to classify and assess the frictional properties of floor surfaces, in reference to onsite testing. 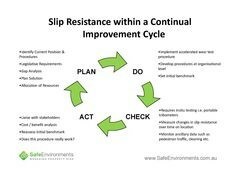 Knowing that the slip resistance can change significantly, how do we incorporate this into our design? The development of accelerated wear slip testing started by investigating the effect of abrasive materials on ceramic tiles in combination of the pendulum test. The results confirmed that small amounts of seemingly immaterial wear can cause dramatic changes in slip resistance. A machine was devised to wear samples by sliding an abrasive pad with a prescribed force over the tiles’ surface, when wet with water. The slip resistance is measured initially according to AS/NZS 4586 wet pendulum method and again after 100, 500, 1000, and 5000 cycles of wear. A dramatic initial drop occurs within the first 500 cycles with little reduction after 1000 cycles as the reduction then asymptotes. 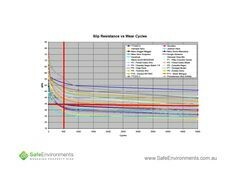 It is at this point, where the slip resistance asymptotes that the in service conditions, or long term sustainable slip resistance of the floor surface is estimated to perform over the longer term. Indicative results suggest that a BPN of 35 (Pendulum Class X) after 500 cycles is a suitable initial benchmark for level surfaces likely to be contaminated with water. It must be noted that onsite testing is quintessential component, where slip resistance benchmarks must be established based on correlation between real world performance and tests on specimens subjected to accelerated wear tests. This then forms a basis of a continual improvement process within a quality management system. A similar example of accelerated wear tests is the Taber Abrasion test ASTM C1353 Standard Test Method Using the Taber Abraser for Abrasion Resistance of Dimension Stone Subjected to Foot Traffic. This test is used to assess the durability of floors, in terms of the volume of material removed through wear and abrasion. David West’s Seminar Stone in Modern Buildings, “Paving : Materials, Finishes , Wear, Slipperiness” clearly states in relation to the Taber abrasion test and wear index results that “correlation with performance in situ has not been confirmed, but general observations suggest the following scale”. This method is still in use today, by architects and stone suppliers to indicate that the stone is durable and fit for its intended use. Another example that is familiar to ceramic tile suppliers is the PEI surface abrasion test which is used to assess the wear resistance of glazes to ceramic tile bodies. This test method does not correlate the pedestrian traffic movements to a high degree, an alternative more accurate method was proposed by Silva et al Qualicer 2006, the world congress on ceramic tiling. Although the PEI test is not perfect and there are more predictable methods, nevertheless the PEI has been fundamental in discriminating those glazes which wear our well short of their intended use. The same refinement is likely to occur with accelerated wear slip resistance testing. Over the last few years this test method has been gaining acceptance, particularly with prominent multinational companies that design, construct and maintain their own buildings. These companies have implemented internal standards based on this methodology to minimise their exposure to risk in slip and fall incidents and litigation. In similar terms accelerated wear slip resistance testing provides architects and tile suppliers alike a greater confidence than they otherwise would, along with reducing any potential legal ramifications. The same accelerated wear slip resistance test enables ceramic tile manufacturers to differentiate their products against their competitors, whilst satisfying the end users needs: thus providing an opportunity for innovation. Product development does not occur through an instant spark of genius, it occurs effectively through a systematic process of continual improvement that takes time. We are starting see the development of more sustainable slip resistant ceramic tiles by optimizing glaze technology. Manufacturers, and supplier who align themselves with those manufacturers, that develop suitable products will create a superior position in this growing niche market. In summary, Standards Australia Handbook (HB) 197 (1999), An Introductory Guide to the Slip Resistance of Pedestrian Surface Materials, provides guidance on the selection of pedestrian surface materials for specific locations, using the test methods outlined in AS/NZS 4586 in consideration of other design features the following points will assist those specifying the slip resistance of floor surfaces . Identify the level of slip resistance required within the building with reference to Standards Australia Handbook 197 An Introductory guide to the slip resistance of pedestrian surfaces. Specify the slip resistance test method which simulates the intended conditions in terms of footwear and contamination. Note that there is no correlation between ramp and pendulum test methods. In general terms, the wet pendulum and dry FFT slip resistance testing methods should be used in all situations with additional ramp slip resistance testing in specific specialised industrial processes or barefoot situations. Accelerated wear testing can indicate limitations on products, thus eliminating potentially dangerous products from being specified. BPN of 35 after 500 cycles provides an initial benchmark for level surfaces. As well as providing slip resistive flooring other design features should be considered to reduce the extent and likelihood of a slip and fall occurring. Confirm that the specified product meets the performance criteria and document the process to provide evidence of due diligence.